of those three, King is the only one who *might* face a competitive primary. "For he who lacks these things is shortsighted, even to blindness, and has forgotten that he was cleansed from his old sins." Last week, one of our most trusted sources expressed the following sentiment: "The [school choice] lobby has to be the dumbest, most incompetent, group at the Capitol. Here you have the public school lobby actively encouraging Democrats to vote in the Republican primary, and it's being left to individual county party executive committees to smoke this behavior out. What gives?!?" That was a good start, but there are several other reasons why we think the effort remains doomed for the foreseeable future. A school superintendent running as a Republican for the Texas House was slapped with a “no confidence” vote by the local party this week. Hood County GOP Chairman Jim Logan said Largent had it coming. “To our knowledge, he has never participated in local or state Republican Party activities. He has said he disagrees with most of the party platform, and openly disparages Gov. Greg Abbott and Lt. Gov. Dan Patrick,” Logan told The Texas Monitor in an interview. As a result, the executive committee of the local party issued a unanimous vote of no confidence in Largent in the House District 60 race. State Rep. Mike Lang is running for re-election in HD 60 against Largent and Gregory Risse in the March 6 primary. Largent, 52, does not hide his politics. Opining regularly on the Granbury ISD website, the superintendent’s commentaries echo increasingly shrill attacks from the state’s “Big Ed” establishment. In a post titled “Conservative Leadership,” the superintendent defends forced collection of union dues, assails school choice legislation and attacks state Republicans, ridiculing Abbott and Patrick. Hood County residents question whether the superintendent understands the boundaries of professional ethics. Plumping for an $85 million school bond, Largent emailed teachers urging them to call parents to support the debt package at the polls. Some instructors balked at the political gambit, and public-records requests into Largent’s official correspondence are pending with the district. Meantime, Hood County Democrats, including the wife of a GISD School Board member, are actively pushing their support for Largent. “He’ll attend Democratic Party meetings and has declined our invitations,” Logan noted. That's all well and good. We're glad that the Hood County Republican party stepped up to the plate. But this is going on all over the state, and it shouldn't be left up to local activists to play an ad hoc game of whack-a-mole to smoke this out. Empower Texans and the Texas Monitor have done good work exposing this nonsense, but they're general interest publications. They can only do so much. Where are the single issue education reform groups?!? Imagine an alternative scenario: Every time one of these socialized education front groups attempts to get Democrats voting in the Republican primary, the conservative "education reformers" are on it in the local community. Then they get the message out in each individual community on their own. Nobody waits for general interest websites that might or might not ultimately pick up the story. It's too soon to know the ultimate number, but there will be house seats left on the table this cycle because the socialized education bureaucracy gets democrats to vote in the Republican primary. And a big reason why will be because the single-issue education reform groups failed to take care of business. General interest websites can only do so much. Between his disgraceful personal conduct and the lies he's told related to school finance, there are few house members less deserving of another term than Dan Huberty. It's bad enough for Huberty to have a cakewalk re-election campaign from an ethics perspective and a school finance/property taxes perspective. So, you have a committee chairman who disses you in the most humiliatingly public way possible?!? And you represent an issue where donors have recently started to open checkbooks. Yet the only person opposing the committee chairman in question has $440.00 cash on hand. 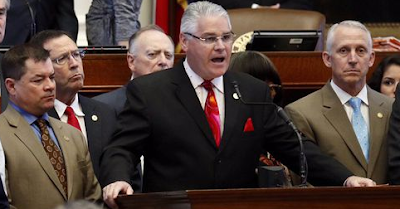 The school choice advocacy community's failure to make an example out of Dan Huberty means their issue will be just as dead on arrival in the house next session (even with a new speaker) as it was last session (they'll just be nicer about it). In other words, in addition to failing to unseat the biggest obstacle to the legislative change you're seeking, you're also leaving in place the guy being groomed to be his successor. Answer this question: If you're a Republican house member, and you're personally on the fence about school choice, how would YOU interpret Huberty and VanDeaver coming back without much of a fight?!? Beyond the shortcomings of any particular election cycle (after election cycle, after election cycle, after election cycle), the biggest problem school choice advocates face is that their efforts both fall short and aren't focused where they need to be. School choice advocates love to talk about how school choice is "the civil rights issue of our time." But their actions don't match their rhetoric. Where's the urgency?!? Newsflash: The actual civil rights movement didn't limit themselves to a passive political strategy. While politics were certainly a component of their strategy, it was only a component. The actual civil rights movement held boycotts (hint, hint). The actual civil rights movement held sit-ins. The actual civil rights movement did a heck of a lot more than simply holding rallies at the state capitol every other year. Then there's the fact that, while school choice advocates can sometimes "drive a conversation" in Austin, they rarely seem to do much in the districts of recalcitrant members. Last session, we suggested to a well known school choice advocate that, if you really wanted to pass a school choice bill next session, you need to start holding sit-ins at high school football games in the districts of recalcitrant rural Republicans. Force the issue at Churches and coffee shops across the relevant districts. We got a blank stare in response. Bottom Line: Absent a gigantic course correction, school choice will remain dead on arrival in the Texas house for the foreseeable future, and the issue's most passionate advocates have no one but themselves to blame. #TXLEGE: Geren suddenly starting to feel heat?! ?